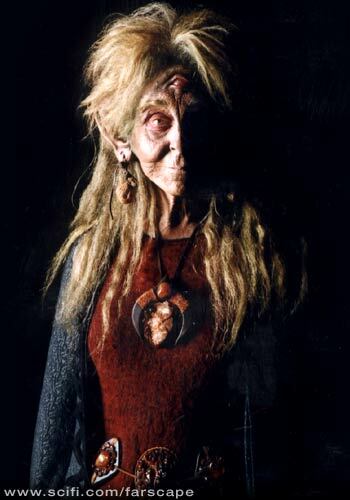 Utu-Noranti Pralatong is a mysterious, three-eyed, hygienically challenged herbalist from the planet Trask. Chef, healer, teacher — she has mastered many callings in her 293 cycles of life. The rest of Moya's crew doesn't know quite what to make of this odd newcomer, who has adopted them as her companions in discovery. The Old Woman is a Traskan who has been kicking around and making trouble (and the galaxy's worst soup) for most of her 293 cycles of life. As a wise man once said, "It's not the years — it's the mileage." The Old Woman has plenty of both under her belt. She's a chef who concocts some of the most horrid dishes Moya's crew has ever tasted. She's a healer whose credo seems to begin with the phrase, "Do a little harm, just to get their attention." She's a teacher whose lessons usually are clouded in riddles and hallucinogenic dust. When she wishes to, she can read people's minds and "project" them into the past or future. She is wise, but dispassionate — forced to choose between the good of a loved one and the good of a thousand strangers, she wouldn't hesitate to sacrifice her loved one in the name of the greater good. She is what John Crichton would call "hygienically challenged." Put plainly, she reeks because she disdains bathing herself or washing her garments. She will often help Crichton and his shipmates find the truth hiding beneath the surface of a situation — if she doesn't get them killed in the process.